Kaïssa (left) and Emeline Michel (right) perform. 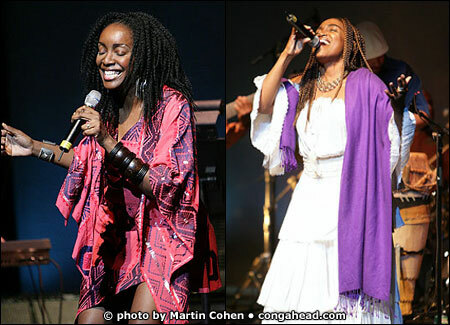 I had the pleasure of seeing Emeline Michel and Kaïssa on March 7, 2005. The event took place at the New York Public Library's Schomburg Center for Research in Black Culture. The performance was part of the Center's Women's Jazz Festival, in conjunction with Women's History Month. Emeline Michel is Queen of the Haitian Song. A versatile vocalist and captivating performer, she is known for her combinations of traditional rhythms with social, political, and inspirational themes, with lyrics that are often complex and conscious. She has performed throughout the Caribbean, Europe, and Africa, as well as North and South America. Kaïssa has been thrilling New York audiences with her unique bland of jazz, R&B, makossa and African / Brazilian fusion. Raised in Paris, this Cameroon native sings against war, cultural differences and injustice. She performs locally at Joe's Pub, SOB's, Zinc Bar, and Jazz Gallery, among others.